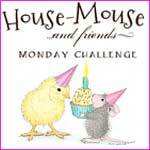 It's time for a new challenge at House-Mouse & Friends MC. STAMPS: Stampabilities, House-Mouse Designs, stamp called " Little Nibbler", featuring Mudpie. It's from the year 2008, #HMUR1052. PAPERS: DCWV-The High School Stack Premium Papers and Black/White/Red/Yellow CS, plus; the Pencil background CS is actually cut from part of a classroom border stack (from the Dollar Store school/teaching section). A fun and super inexpensive find. Isnt that Student Notebook DP for the BG fun for the School Theme? Great to shop at the official House-Mouse Designs store HERE. If that awesome Gift Certificate to the official House-Mouse Designs store doesnt inspire you enough, how about an added bonus prize from little 'ole me? Im giving away this hard-to-find House-Mouse Design of the Month stamp from April 1999. It's called "Computer Tutors" and features Monica, Maxwell and Mudpie. 1- Follow both this blog and the HM&F MC blogs. 2- Play along with us this week by entering your own card/project into the current Back-to-School/At the Office challenge at the HMF MC BLOG HERE. For more inspiration with great School and Office samples by my amazing Teamies, please come visit us at: House-Mouse and Friends MC HERE. Your card is so darn cute! Love that pencil background paper and the embossing too. Color combo is wonderful. Love that stamp you are giving away, so very generous......that's you alright!!!! Hope the puppy is doing good. Gorgeous creation, America...proud to have been this month GDT! Wowzer perfect school creation clever to use the lined papers, great design & colours..that likkle mouse is defo frustrated..lol great work teamie. So cute! I love your design and the texture you added. Totally cute, America, I love the image and your colouring is fab. Thanks for a great theme. Hi America, nope - still computer probs - am taking back to the UK in Oct. Your card is adorable, I love the design and stunning colours. Your colouring for the cute image is breathtaking!!! super cute and gorgeous card America. Thanks for joining us at Forever Friends 'Anything Goes' Challenge... you have made a lovely card. Beautiful card!! Love the papers and your embossing!! Thanks for joining us at Tammy's Scrapin Corner!! Hope to see you again next week! This is soooooo cuuuuuute! I just love that little mouse! Your DP is fantastic with him. America this is so so cute and fun. The textures are awesome, love the charms and dp. Just so darn cute. This is just gorgeous. Love the colours and embellishments. All the elements work so well together. I saw this on MIM and just had to pop over to have a closer look. Wishing you a Wednesday. Hop on over to Doing Life - for a chance to win some lovely digi stamps from DS4J to the value of 20$. A gorgeous card America, love the cute image and beautiful design. Thanks for joining us at AGOAC. Thanks for playing along with us at Bearly Mine's Glittter challenge this week with your stunning card. Absolutly super sweet and so cool! Awsome card! - I love it!